The photo alone made Addiction Kohl Eyeliner 01 Night Dive pretty irresistible. Just look at the blue side of the Night Dive (01) duo. 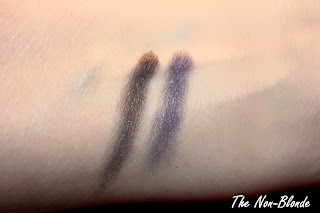 I was curious about the texture, since a kohl liner in cake form was new to me (I do love the regular cake eyeliners from Laura Mercier, but they're meant for tightlining and a more precise application). Addiction (a Japanese department store brand) offers these pressed powder kohl liners in four color combinations. Night Dive was an obvious choice as my first one, but I have to tell you that I've already got my eye on the other ones. If you ever tried the loose kohl powder from Guerlain you know that it gives beautiful results once you get the hang of it, but it gets e-v-e-r-y-w-h-e-r-e. 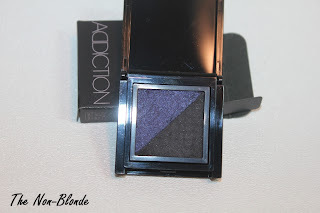 This problem is solved in this case because Addiction kohl is not just pressed, it also has an intriguing almost creamy texture, especially the blue side of Night Dive (the black is more dry and powdery). It's extremely long-lasting (as in stays put and bright for at least 12 hours). The big mystery for me was application. I read these reviews on Drivel About Frivol and Rouge Deluxe, and found them a great help for my own experiments. Teeny tiny eyeliner brushes really don't work in this case because you want a thicker line and a smoky effect. Some pencil brushes and smudge brushes aren't tight enough or directional enough, and since the kohl is so densely pigmented some brushes pick way too much product (resulting in a massive fallout). I've had this Addiction Kohl for several months now, but by no means am I an expert. I can say that I join Kate's recommendation for the Hakuhodo G5515 and will add Paula Dorf's Smokie Eye and Smudge brushes. For a softer effect I can also go with a domed brush (Sephora or NARS). I'm still learning, though. Addiction Kohl Liner is available in select locations in Asia and from Ichibankao.com (about $40 including markup and shipping). Hi Gaia, beautiful swatches!! 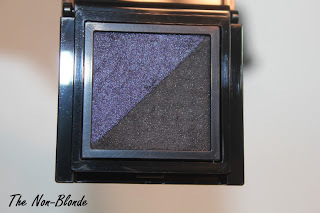 The blue/purple side really appeals to me (and to my brown eyes)! I have no experience with kohl/cake eyeliners: how do they compare with regular (pigmented) pressed powder eyeshadows? Are kohl liners in cake form very different? Oh my goodness, the burgundy one...well, I guess it's about time I finally try Addiction! I am now interested in getting an item or two from Addiction via Ichibankao. I, like you, live in the U.S. Did you have to pay for anything extra like custom duties and Fed Ex fees to get this item? When I bought Suquu items from Selfridges recently, I had these extra charges. Thanks Gaia.